So… from our first day’s tutorial. we were able to setup our organisation’s preferences, setup our organisations job levels and our departmental List of Values(LoV). Lastly, we learnt how to create an employee and where needed, how to import employees en-mass using an Excel sheet template. To begin, open your browser and type in the address csmanager.com.ng. The page displayed is the landing page from which this entire tutorial would be done. Proceed to login to your administrative account. Once okay with your list, you are to begin creating your organisation’s leave groups. Organisational leave groups within CSManager©HRMS enables HR categorize employees into leave buckets. Employees in the same leave groups automatically have the same number of leave days assigned to them for a year. 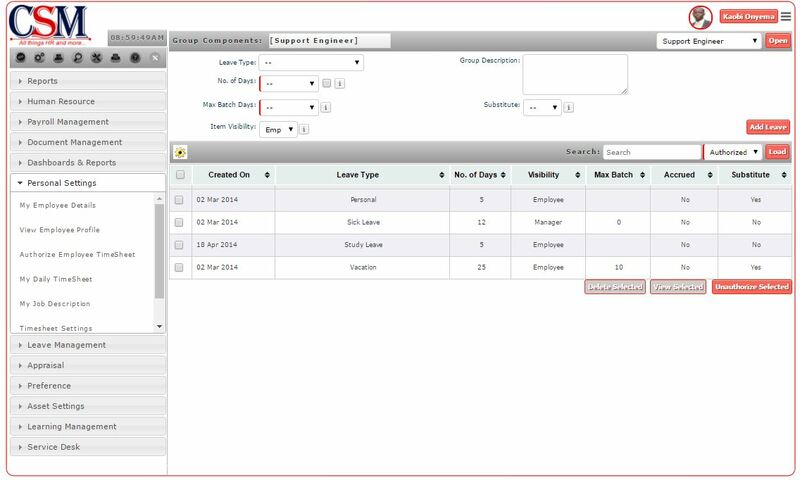 Leave groups within CSManager©HRMS are also set based on Job Levels. However, one or more job levels can use the same leave group. A typical example is a leave group called Support Group. Within the support leave group, I may define 15 Days Annual, 5 Days Personal, 12 Days Sick, 3 Days Study leave days. This leave group may then be used for all employees across all 8 levels within my mid-tier support staff across all departments in my organisation. Hence, once a new employee is hired in my organisation and placed in any job level that uses this leave group, these leave days automatically applies to that employee. Type in a description to identify this leave group for future reference. This may simple contain the job levels you wish to assign this leave group. Select a Period of Stay (This is the minimum period for which an employee must have stayed in the company’s employment before they are allowed to apply for a leave. In most organisations, this is set to One(1) year – 365 days). Setting this value enables CSManager©HRMS to calculate the employees stay period from the date of employment to current day and assign appropriate leave days. Note: You may have different Stay Periods for different leave groups. Eg. For junior employees, this may be set to 1 year while to top management recruits, this may be set to 3 – 6 months depending on your organisational preferences). Select employees you wish to receive notifications once anyone in this group applies for a leave or when such leave days are approved. This setting helps members of the HR team get notified when there is a new leave application. For much larger organisations, we recommend turning ON only Final Notification as setting an employee for Request Notifications may flood their mail boxes with excessive mails that may be from leaves that end up being cancelled or rejected. 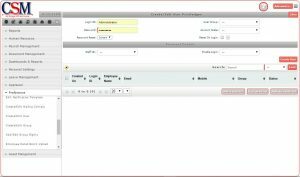 For the sake of this tutorial, we would leave this unset at this level save for where you have already created multiple employees or imported your employee data, then feel free to select an employee here as appropriate. Now, click on Create Group to complete your leave creation First Step. Your leave group should now be visible below in the details area. Where this is not the case, simply click on the drop-down next to the Load button and select Unauthorized… then click on Load to view your leave group. All records in CSManager©HRMS stay unauthorized until they are checked and approved by a higher officer. In this case however, you are making use of the administrative account which has both the Maker and Checker rights attached to it. Now that you have successfully created your first leave group, we would now proceed to setting up the components that make up the the leave group. The Group component page is displayed. Next, select the maximum number of days an individual can take off at a single time else select “–” if this limit does not apply (a good example is 25 Days Annual Leave – However, I can only apply for a max of 10 days at a time). 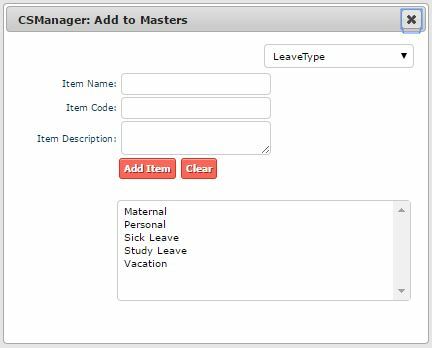 Select if a Substitute backup employee is compulsory for this leave type when being applied for. Now, click on Add Leave to complete the process. Your leave component should now be added successfully. To view this, simply select Unauthorized from the drop-down next to the search box and then click on the Load button. Now, repeat this step as many times as required to add the different days to each leave type. Sick Leave, Study Leave, Vacation or Annual leave, Personal leave, Maternity and Paternity and others that may apply to each specific leave group. 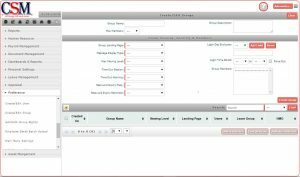 Once done, Select the Unauthorized drop-down menu to load all records added for the group, check the boxes to the left of each of the leave components and click on the Authorized Selected button to confirm your additions. Wow… that took a bit. But you are now done. A number of SME’s would have 3 to 4 of these Leave groups defined for the entire organisation. In most cases, for Junior, Mid-Level, Senior and Executive Level leave groups. We have a saying at Amoseries that helps put user creation in perspective. All Users are Employees… not all Employees are Users. What this means is that I can have 2,500 employees registered across 39 branches of my business, but only have 2,320 users. An example of this is… a cleaner is an employee just as a driver or an office assistance and can be fully captured and managed by the system – however, they may never be required to login to the system and may hence not be created as users with a username and password. User accounts are collected within groups termed user groups. A user group would basically have employees who have similar functions and perform similar activities within the system. Setting up user accounts is a one time feature per user. Enter a group name and descriptions you want to create. 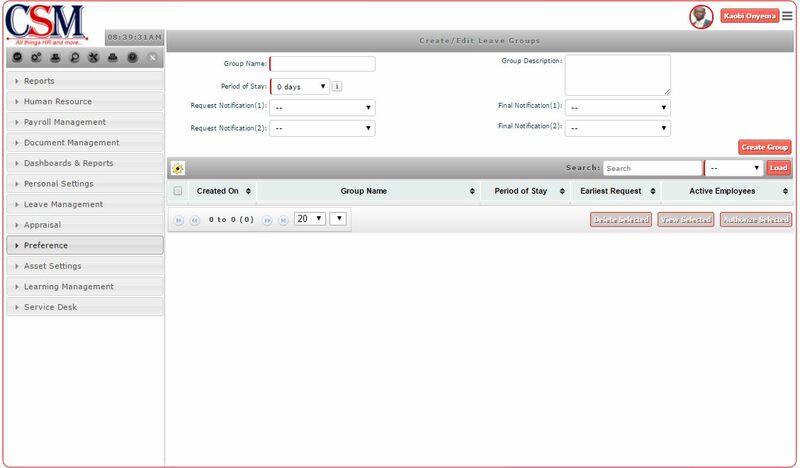 Select the maximum number of employees for the group. You are presented with a screen with fields relevant to creating the user. Select all compulsory field marked red, from the drop down menu and other fields as applies. Click create group button to save. Now you are ready to create your first user – Yourself. Click create user button to save.